Houston auto glass professionals have always longed for a new type of glass that would repel dirt and grime, wipe clean with just a damp sponge and stay crystal clear throughout its life. Homeowners have expressed the same desires for residential glass. The good news is that a new product, Guardian ShowerGuard, is now being installed in Houston shower doors by selected providers to fulfill the wishes of homeowners. ShowerGuard is far from ordinary glass. During the manufacturing process, an ion-beam process is used to incorporate protection for the surface of the glass. This high-energy process uses patented technology to seal the surface permanently. Grime, soap scrum, hard water deposits and dirt cannot penetrate the protective coating to become attached to the glass, so the glass stays showroom clean as is not subjected to the damaging effects of surface corrosion. Unlike treatments that are wiped or sprayed onto the glass after they are manufactured or installed, the protection offered by ShowerGuard glass is permanent. After-manufacturing treatments wear off and require frequent reapplication. 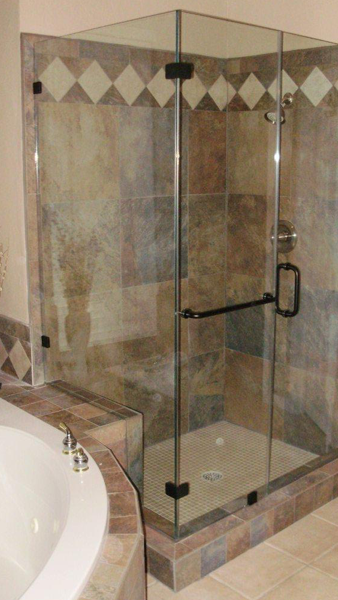 Properly maintained, ShowerGuard glass retains its protective properties for many years. ShowerGuard glass does not require any special maintenance. All homeowners need to do is clean it periodically — and cleaning ShowerGuard glass is easy. No costly cleansers are needed as most common, non-abrasive household cleaning products will yield excellent results without damaging the protective coating. Just use one of the many cleansers approved for use on ShowerGuard glass, wipe it with a damp sponge or cloth and finish by rinsing with clear water. Always follow the instructions provided by the manufacturer of the cleanser selected, keeping in mind that some cleansers are not safe for use on marble, uncoated brass or other materials. How often ShowerGuard glass will need to be cleaned depends on factors such as frequency of use and mineral content of the water, but homeowners typically do not need to clean it any more often than they cleaned their old glass. Untreated glass can be damaged by the corrosive properties of soap, hard water, humidity and even cleansers. Glass reacts chemically with contaminants, resulting in residues, stains, scale and spots. These deposits can corrode or discolor the glass. In a very short time, the glass has been damaged to the point that no amount of scrubbing can ever restore it to a pristine state. Due to its special coating, ShowerGuard prevents corrosive contaminants from reaching the glass, so it is protected from damage. 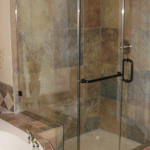 What Types of ShowerGuard Glass are Available? ShowerGuard glass is available in three different styles to make it easy for homeowners to choose the perfect product for their needs. ShowerGuard Clear: Available in thicknesses of 6, 10 and 12 millimeters. ShowerGuard UltraWhite: This is actually a clear glass that uses a low-iron formula to reduce the greenish tint that is commonly found in standard glass. The product offers stunning clarity and is ideally suited for those desiring a contemporary, open look. It is available in 10- and 12-millimeter thicknesses. ShowerGuard SatinDeco: For those who prefer an elegant glass, ShowerGuard SatinDeco is an ideal choice. It provides a frosted appearance and is offered in thicknesses of 10 and 12 millimeters. ShowerGuard glass is made by Guardian Industries Corporation, a privately held company with headquarters in Auburn Hills, Michigan. The name is quite familiar to residential glass and Houston windshield replacement providers — the company was founded in 1932 as Guardian Glass Company to manufacture automotive windshields. Today, Guardian Industries in one of the largest manufacturers of fabricated glass products and float glass in the world. Where Can I Buy ShowerGuard Glass? Apple Glass Company has been providing customers in the Houston metropolitan area and The Woodlands with residential, commercial and automotive glass for more than 25 years. We are proud to offer ShowerGuard Glass to area homeowners. We have established a proven reputation for providing quality work at affordable prices. If you would like to learn more about ShowerGuard glass or any of our other services, you can request a free quote by submitting our online form. If you prefer, you can call our Houston location at (713) 680-1400 or our location in The Woodlands at (281)296-0600. This entry was posted in Showerguard, Showers and tagged Houston Auto Glass, Houston Shower Doors, Houston Windshield Replacement. Bookmark the permalink.